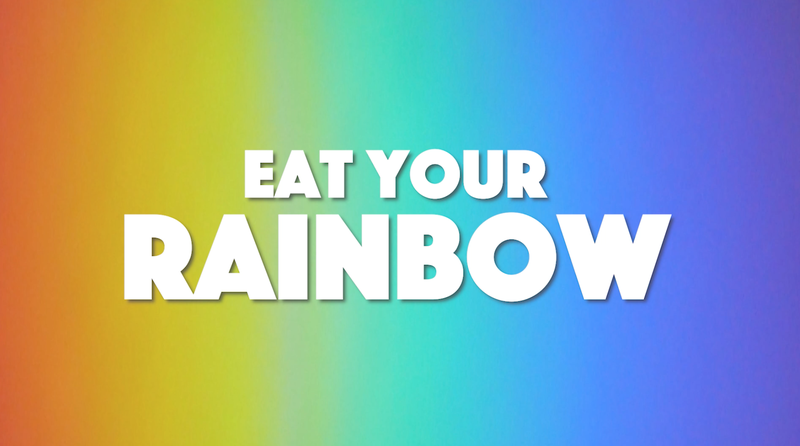 We often hear the phrase “eat your rainbow” and I’m a big advocate on that too. What does it mean and why is it important? It is a simple way of reminding us to consume a variety of fruits and vegetables to get the vitamins and minerals your body needs. The standard western diet tends to fall into the “beige” colour. 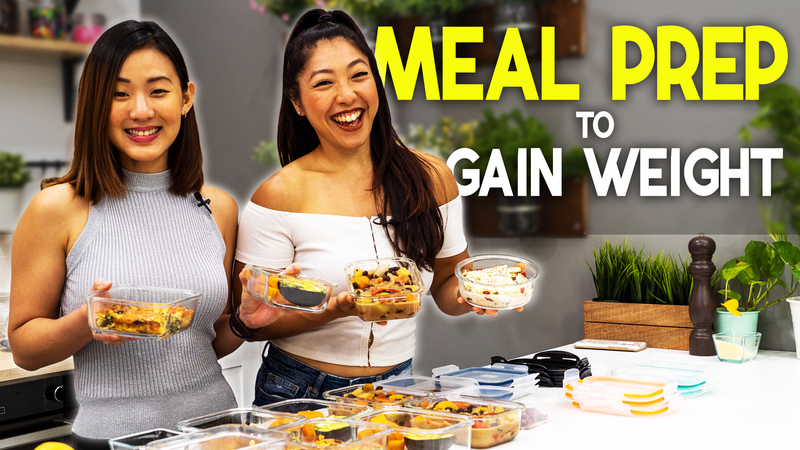 Just think of a typical day: porridge, cereal, granola, sausages, pastries, sandwich, and pasta, chicken. Yeah, you know what I mean. “Eating Your Rainbow,” means adding red, green, yellow or orange, purple or blue and white or brown fruits and vegetables into your diet every day. Each colour carries its own set of unique healing chemicals called phytochemicals. It is these phytochemicals that give fruits and vegetables their vibrant colour and their health properties. We all know that we should be consuming our 5-a-day! (2 cups of fruits and 3 cups of vegetables). However, the average person only consumes 1.8 cups of fruits and vegetables per day. Eating your rainbow is simple and it is actually the first and most important step to take for you to get healthy! Let’s take a look at each colour. Think of tomatoes, strawberries, watermelon, apples, red peppers, goji berries, cherries red rice, adzuki beans, red quinoa and more! 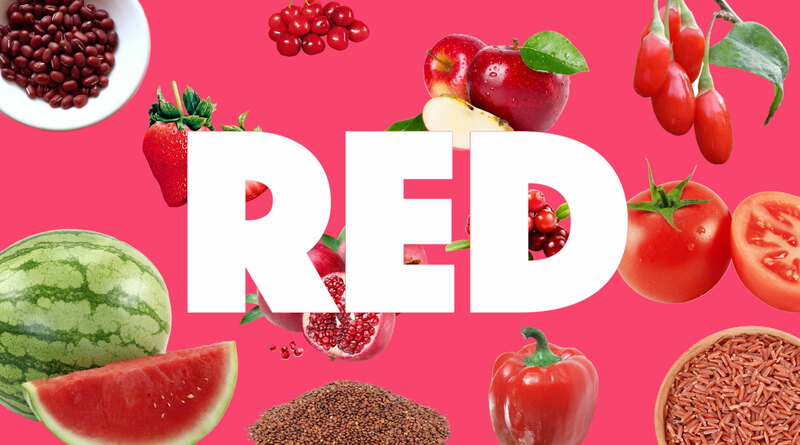 Red fruits and vegetables are coloured by a natural plant pigment called lycopene. Lycopene is a powerful antioxidant that can help keep your heart healthy and reduce the risk of cancer, especially prostate cancer. In a study of 50,000 men, it was found that men with the highest levels of lycopene were 21% less likely to develop prostate cancer than those with low levels. It can also prevent damage from pesticides on our body. Not all of us can afford organic produce free of pesticides on a regular basis, therefore it is important to eat red fruits and vegetables. I’m sure you have heard of eating carrots being good for your eyesight, but why is this so? 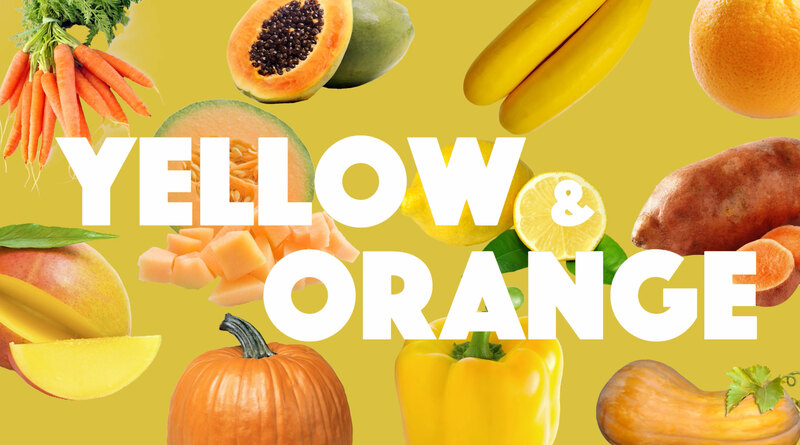 Yellow and orange fruits and vegetables are high in beta-carotene, which is converted to Vitamin A in the body. Vitamin A is important for maintaining eye health, boost immunity and for cell growth. Two other carotenoids are also present in yellow orange fruits, lutein and zeaxanthin. This helps prevent age-related eye degeneration, which can lead to blindness. Think of squashes, carrots, pumpkins, oranges, lemons, sweet potatoes, banana, peppers, yellow zucchinis, mangoes, papayas, cantaloupe and more. Another simple tip is to add a squeeze of lemon juice to your meal to increase iron absorption, plus it can add flavour to your food. 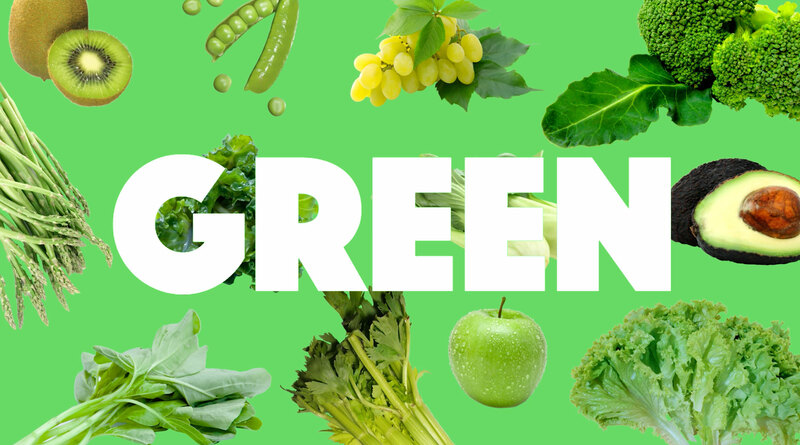 Green vegetables are the most common colour we consume. They are also extremely low in calories hence they can help you to lose weight and maintain a healthy body weight. They are also high in fibre and can make you feel full faster. Green vegetables have an abundance of vitamin A, C and K. Vitamin K is important for protecting bones from osteoporosis. Leafy greens like spinach and broccoli are also rich in folate, which is a B vitamin especially important for pregnant women for preventing birth defects. Besides spinach and broccoli, other greens include lettuce, bok choy, kale, green grapes and apples, asparagus, avocado, kiwifruit, peas, celery and more. 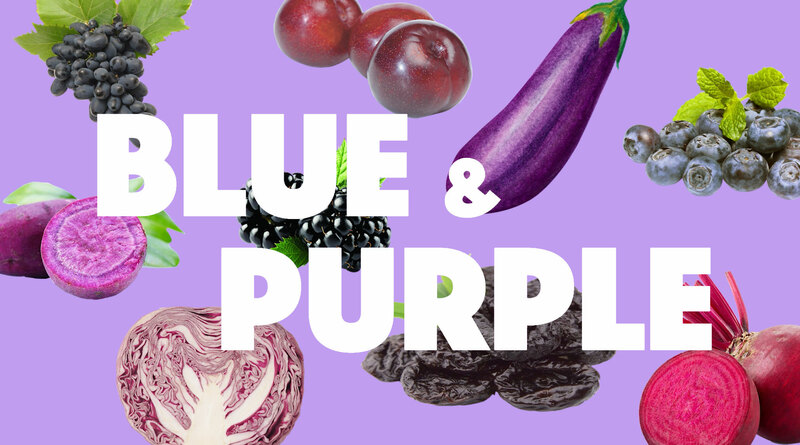 Unfortunately purple foods only make up about 3% of the average western diet, which tells us we need to increase our intake of these fruits and vegetables. 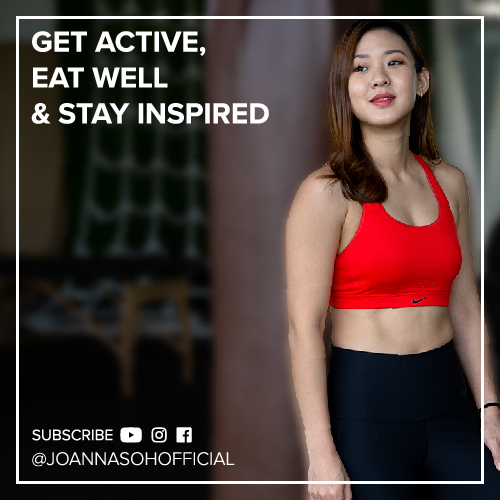 Start to consume more beetroot, purple sweet potato, red cabbage, eggplant, blackberries, blueberries, plums, prunes and purple grapes. The plant pigment anthocyanin is what gives blue/purple fruits and vegetables their distinctive colour. There is also some anthocyanin in red fruits and vegetables, although this is not present as much as in blue purple fruits and vegetables. Anthocyani has antioxidant properties that protect cells from damage and can help reduce the risk of cancer, stroke and heart disease. Anthocyanin also promotes longevity. Hear this, wine is high in anthocyanin, resveratrol and other flavonoids. Hence consuming wine in small amount can be good for your health. Flavonoids are also found the purples sweet potato and one of the reasons why the Japanese in Okinawa are known to live a long life. 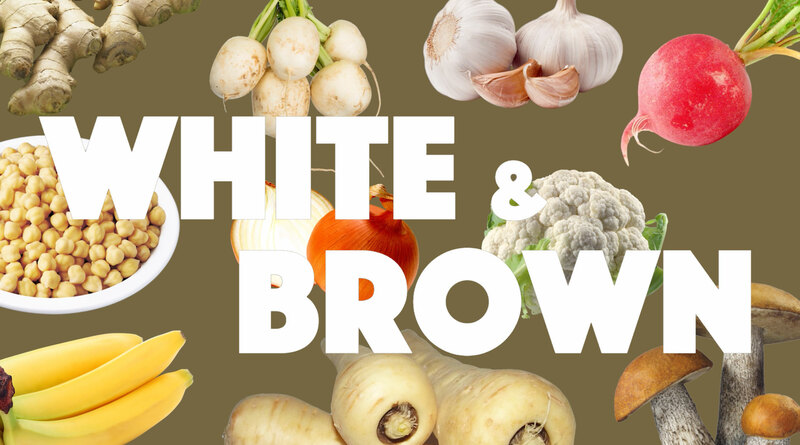 White brown vegetables are perhaps the most neglected group of vegetables. Although not technically a colour of the rainbow, white vegetables are high in anthoxanthins - a type of flavonoid. Anthoxanthins have been found to reduce blood pressure. In a 10-year study, researchers found that those who consumed white fruits and vegetables regularly were 50% less likely to get a stroke. Another important element white brown fruits have is sulfur. Sulfur is important for keratin, which gives nails, hair and skin their shape. A lack of sulfur will lead to dull and saggy skin. Some white vegetables such as garlic contain allicin, which has antimicrobial and antiviral properties. Others, such as bananas and potatoes, are also a good source of potassium. Start adding cauliflower, mushrooms, garlic, onions, ginger, bananas, parsnips, turnips, pears, chickpeas, and radish into your diet. The next time you shop and cook, think of the rainbow chart and pack as much colours as you can into your meals. To start of, consume at least two to three colours for each meal. Make your plate colourful and trust me, you will see and feel the difference on your skin, your body and waistline. 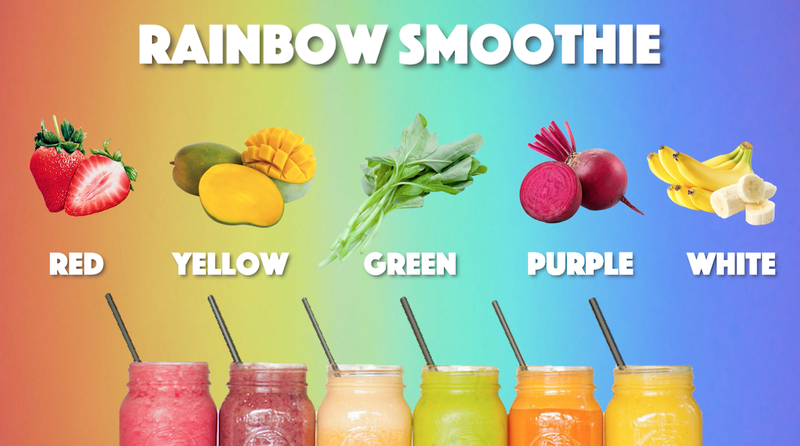 Another tip is to create your own rainbow smoothie by packing in all the colours. For example a blend of strawberries, mangoes, spinach, beetroot and banana. Use this printable chart to hang in your kitchen to help your you make healthy choices every day. 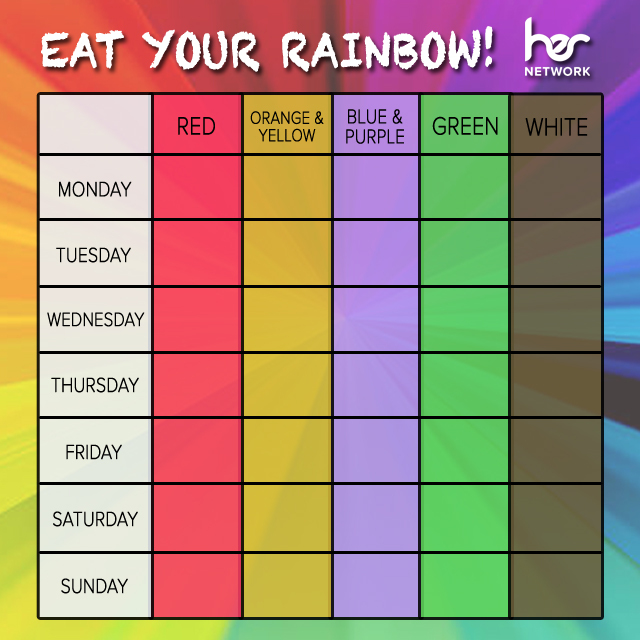 The goal is eat as many colors of the rainbow as possible throughout each week.